This article appeared on The Brad Blog and is reposted here with permission of the author. 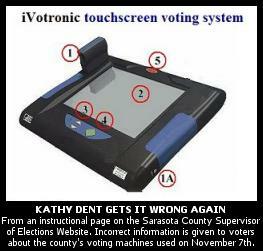 An instructional web page, explaining the ES&S touch-screen electronic voting machines in use during Florida's disputed FL-13 U.S. House Election gives faulty information to voters about the way the county's paperless voting systems works, The BRAD BLOG has learned. The information offered on the County's election website, concerning the crucial process during which voters might choose to adjust any "undervotes" found on their electronic "ballots" at the end of the voting process, is misleading and incorrect. According to several sources, the systems in use during the contested November 7th U.S. House race between Vern Buchanan (R) and Christine Jennings (D) did not operate as promised on the Sarasota website. The county web page in question is described as "a technical look at how the ES&S iVotronic touch screen system works." Yet, Sarasota's ES&S iVotronic systems, apparently, didn't work as described on the site. The "VOTE button" on the iVotronic, as explained by the text on the website, will cast the vote only after reaching the summary page is given to the voters, allowing them to explicitly approve or disapprove of any undervotes found on their "ballots." "The iVotronic will review the ballot for any races for which the voter did not cast a vote (undervote), and asks if this is the intent of the voter," according to the webpage. The voter is then said to receive a YES or NO option to confirm their intention of undervoting in the particular race(s). Lowell Finley, however, an attorney for VoterAction.org --- one of several non-partisan organizations leading a voter lawsuit demanding a revote in the election --- tells The BRAD BLOG that "the statement on the Sarasota website is false" and that voters were not given such an option on November 7th. Someone who answered the phone in the Administrative Office, but subsequently refused to either give her name or allow herself to be quoted even off the record, confirmed that there is no explicit "YES or NO" confirmation concerning undervotes at the end of the voting process before the "ballot" is finally cast. The contested election now stands with just 369 votes between Republican Buchanan and Jennings according to the state certified results. But some 18,000 votes were lost from "ballots" which failed to register any vote at all for either candidate in Jennings' strongest areas. That undervote rate, approximately 15%, is far higher than any other county in the same district for the same race. The paper Absentee Ballot undervote rate in the same county for that same race was just 2.6%, which would seem to counter the disingenuous claims of Buchanan and his supporters who claim that voters purposely chose not to vote in that particular race for some reason. Many voters have given statements to the Jennings campaign, to local newspapers, and to attorneys who are challenging the election claiming they were disenfranchised after they had tried several times to vote for Jennings, but the machine failed to register their vote. The VOTE button finalizes the voter's selections and casts his/her vote, then clears the screen in preparation for the next voter. Upon proper selection of choices, the voter is brought to a summary screen which displays those choices on each item on the ballot. At this time, the voter can make changes by touching the ballot item on the summary screen, whereby they will go back to that item to review or change a choice. When finished, the review screen reflects the updated selections. The iVotronic will review the ballot for any races for which the voter did not cast a vote (undervote), and asks if this is the intent of the voter. Upon selection of "YES", the VOTE button will illuminate and the voter will be prompted to press the button to cast the ballot. If the undervote question is answered "NO", then the voter will have the opportunity to return to the ballot and make a choice. At this time the voter can review the summary screen and press the VOTE button to cast the ballot. The statement on the Sarasota website is false. The iVotronic ballot summary screen layout in Sarasota County does not ask if it is the intent of the voter to undervote, nor does it call for a "YES" or "NO" response. Instead, if no vote has been entered for an office, the summary screen states "No selection made" in small red print under the title of the office, and leaves the box next to the office blank. A general instruction about how to return to a selection screen to make a change is always displayed on the summary screen, whether or not such an undervote is included. These are hardly intuitive or user friendly methods of alerting and instructing the voter. Thus, it is possible to undervote unintentionally, and some almost certainly did as a result of failing to see the race due to poor ballot layout. More important, however, there is strong evidence that this does not explain much of the undervoting, which was due to machine malfunction.